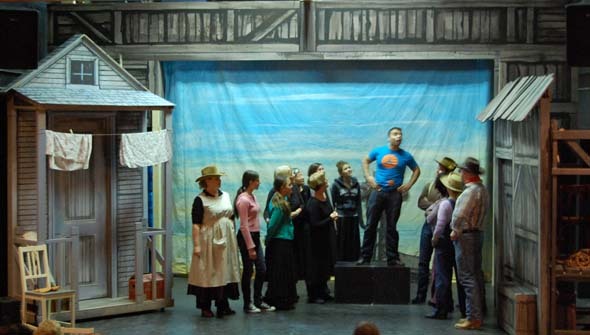 The cast rehearses Oklahoma! at Hudson Village Theatre in February 2013. There are a lot of cowboy hats at the Village Theatre. That’s because, after entering the front doors, you’re not in Hudson any more. Welcome to Oklahoma! There are more than a dozen actors on the tiny stage, dancing without knocking into each other (mostly), a testament to Terry Girouard’s imaginative choreography. Co-directors Karen Cromar and Glen Bowser came to this show and the unique challenges of the Hudson Village Theatre in October, a month later than production would normally start. Oklahoma had to be adapted to a very small stage that generally hosts five to eight actors vs. Oklahoma’s 23 cast members. They have the history of the musical itself on their side: It has been reinterpreted in many ways since it was first produced in 1943. The London production even added songs and dialogue. While more than five months of setup and rehearsal would be considered a luxury for a big theatre, it’s just barely enough time for a volunteer-run organization to learn a script, 16 songs and how to not step on each other’s toes in 42 carefully blocked scenes. It’s just enough time, also, to figure out how to make winter wonderland Quebec look like the Great Plains. “We had a meeting with set designer Jean-Claude Olivier to see whether it could be done,” says producer André Marchand. “He goes, ‘Oh, it’s a very small stage.’ I said, ‘But is it doable?’ and as the meeting went on, he became more enthusiastic.” Enthusiastic enough to build a set in which the house and walls move to depict vastly different scenes. “We’ve come a long way musically, but they are nailing it now,” agrees musical director Sheila Engel Katz. There’s a “yee-haw!” from a lady up front. This production promises to go about as far as it can go. And then some. Oklahoma stars Jordan Marchand as Curly, Gail Marchand as Aunt Eller, Stefania Vetere as Laurey and Simon Côté as Jud. It runs till March 23 at Hudson Village Theatre, 28 Wharf in Hudson. 450-458-5361, villagetheatre.ca. Correction: An earlier version of this story misidentified Mike Melino. The Senior Times regrets the error. 1 Comment on "Theatre preview: Oklahoma at Hudson Village Theatre"